Making a paper flower is a great way to flex your creativity muscle, decorate your home, or give someone a small but thoughtful gift. You can make a variety of paper flowers while using construction paper, tissue paper, or even origami paper. 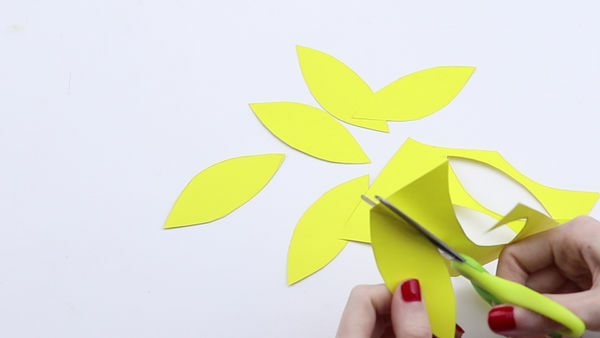 If you want to make a paper flower in no time at all, just follow these steps. 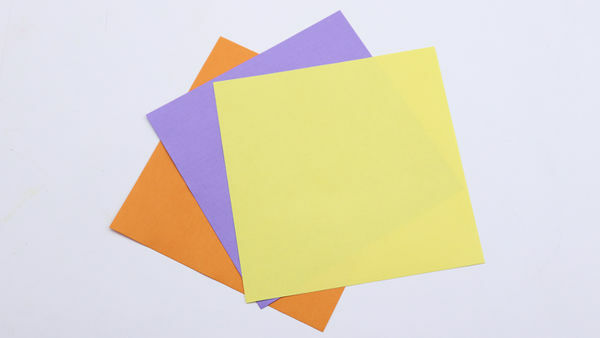 Pick a piece of construction paper that's nice and sturdy and a bright and happy color, like yellow. Use scissors to cut at least six petals that are at least four inches long. If you like, you can lightly draw the petal shape with a pencil and then cut around the inside of the shape to avoid pencil marks. You can also use one of the petals as a template to cut the rest of the petals, or create six slightly unique shapes -- after all, the petals on a real flower aren't the exact same length, either. If you want to give a little extra texture to the petals, you can roll them around a pencil to make them curl upwards. You can also consider using tissue paper for the petals, or using a mix of tissue paper and actual petals. If you'd like to create less of a 3-D effect, then you can just cut one flower shape with all of the six petals connected at the center. The center of the flower can be anything your heart desires -- you can use a piece of candy, some beads, or even a picture of a special someone. You can also just cut out a circle from a different color of construction paper. You can even create a three-dimensional center by wadding one piece of tissue paper into a ball and wrapping a second one around it while gathering its edges at the bottom to create a rounded top. Once you've selected your center, arrange all of the petals together in a flower-like circle. Use a glue gun, regular glue, or glue-stick to glue the center to the rest of the petals. This should secure all of the petals together and should create a nice flower-like shape. If your center is relatively small, you can also consider glueing the petals together before you put the center on for extra reinforcement.
" Find a thin stick in your backyard, use a wooden chopstick, buy a "stem" from a craft store, or take an ordinary straw and paint it brown. The stem should be proportional to the flower, so hold them up together to make sure the stem isn't too long or too short. Using a real stick may be the most authentic move, but keep in mind that it won't be as clean as something you can find at home, and that it may be harder to attach it to leaves or petals. 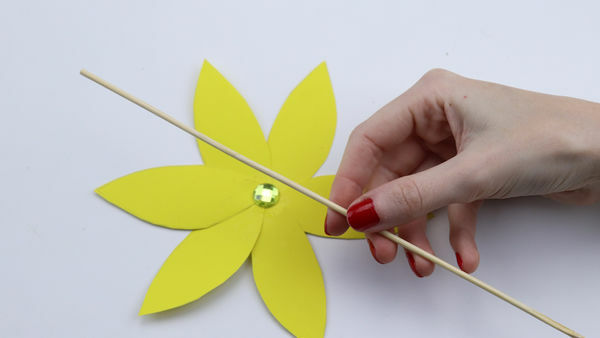 To connect the flower with the stem, you can use tape, glue, or even a stapler. If the petals of the flower are separated, you can pinch them around the center of the stem and then wrap tape around the petals and the stem to make sure they stay. 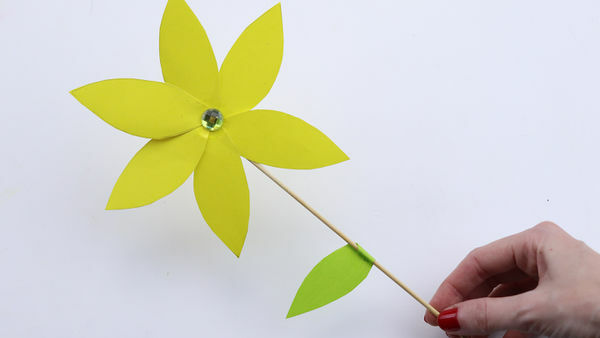 You can also use a hot glue gun to connect just a bit of construction paper with the stem and petals to hold them together. If you don't like the taped look, you can even paint over the tape with a color that matches your flower so it blends in more. To create leaves, you can just cut them out of paper and even draw veins on them with brown marker, get fake leaves at a craft store, or even try using green feathers. To attach them to your stem, you can use tape, a stapler (if the stem is a straw), or even try a bit of glue. If you like the flower, consider making an entire paper-flower bouquet. This can be a great addition to your home or office. If you want the flower to look more dynamic, make sure that each piece of paper is a different color. Pick colors that will look good together, like red, purple, and yellow. If you pick colors that are too similar, like dark blue and purple, then they'll blend in together. For a more sturdy flower, you can use construction paper, and for a more loose, flowing flower you can use origami paper. 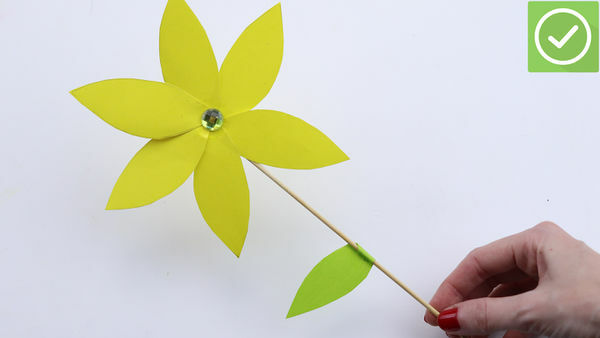 Cut a large and small-sized flower from every paper. Follow the same or a similar design for each flower. You can just cut an ordinary flower with four or five petals. If you create three stencils in advance, you can use them to trace the same two shapes onto each paper. When you're done, just combine a large and small flower of a different color, placing the large flower below the small flower. Fan out the petals so they don't overlap too much. You should have three flowers made of two different colors. First, create a small hole in the center of the flowers using a very thin pair of scissors or a pin. Stick the pipe cleaner through so that a very small amount, less than 1/2 an inch (~1.3cm) is sticking out through the top of the flower. The pipe cleaner will be the stem of the flower, so you can pick a fun color that will look nice with the petals. To keep the pipe cleaner in place in the center of the flower, you can bend the top so it's too big to go back through the hole, or attach a bead or a button so the flower doesn't come off. Pick a floral perfume to make the paper flowers smell like real flowers. Make sure to spray it far enough away so you don't end up soaking the flowers. Create a nice bouquet with the flowers and place them in a brightly-colored vase. If they look lonely, make some more flowers to keep them company.